Posted on March 7, 2015 by University Sin Fronteras wrote in Atlanta Recent Courses and News, Campus, Current Actions / News, Detroit Recent Events, Recent News, San Antonio Recent News and Events. University Sin Fronteras (www.unsif.org), a University without walls or borders, established in 2011, part of the anchor institutions and organizations of the Southern Movement Assembly (SMA) (www.southtosouth.org), was present in Selma for the Jubilee 50 on the March on the Selma Bridge in 1965. The Southern Movement Assembly (SMA) is coordinated with Project South (www.projectsouth.org) from Atlanta, Georgia. One hundred plus grassroots organizations in the SOUTH make up the SMA. The first Southern Movement Assembly was held down the freedom highway in Lowndes, County at the original site of Tent Freedom City. The role of University Sin Fronteras (UNSIF) is in the development of OLE model. OLE is Organization, Liberatory Leadership and Emancipatory education for and of the grassroots social movement organizations and institutions working for systemic social change. 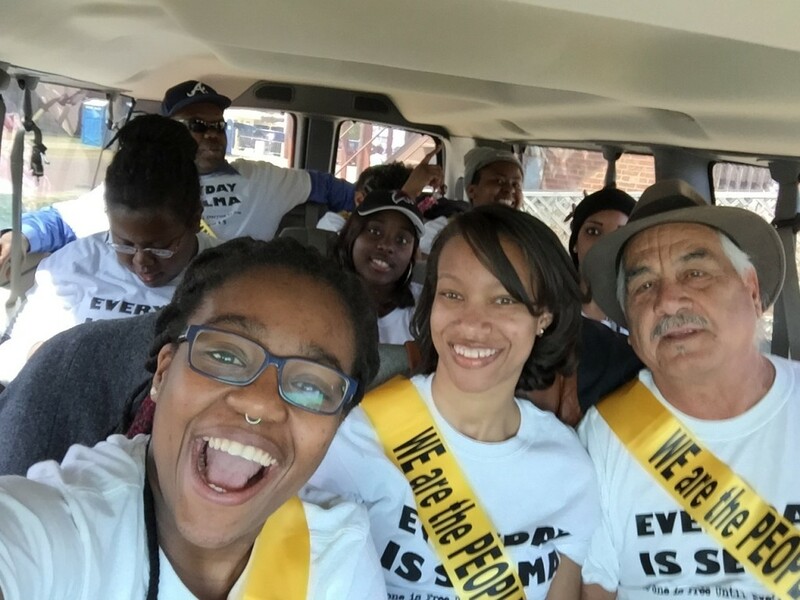 Coming to Selma 50 is part of our Liberation Spring Semester knowledge and experience because space and place matters. UNSIF does this in Atlanta, San Antonio, Detroit, San Juan (PR), Jacksonville, and Bemidjii, Minnesota. Our delegation consisted of over 100 people, and our caravan to Selma about 50 people. The caravan and the people in it made up a ‘campus’ on wheels of the University Sin Fronteras. Collectively we shared knowledge about Selma’s history prepared by Dr Cita Cook, retired historian, and we shared knowledge of those who made the group. It was a multi generational, multi lingual, multi cultural, and multi gender as well as internationalist group. We had Iraqis, Sudanese, Nigerians, Haitians, in the group, and African, Mexican, Puerto Rican, European Americans. The bridge at Selma, I will not call by its colonial and racist name, united the people there, grandmothers and grandchildren, parents, sons and daughters, families, individuals, all marching together over the bridge. It was a LIBERATION bridge. The people led the march over the bridge at Selma, not the politicos. The people came because they needed to be there not for the nostalgia of the brutal repression 50 years ago on Bloody Sunday, but more so for the frontline struggles of today. The people at the bridge were not there for Obama there were there for Micheal Brown and the many young Black (and Brown) men and women being assassinated by the hour in the US today. Of course the media depicted a photo showing Obama and the politicos leading a march before the bridge at Selma, and showed a row of political operatives advancing their agenda for the elections in 2016. We mingled with 75,000 people marching for justice in the long road to liberation paved with short term civil rights and voting gains. The struggle and the people have also suffered set backs like the assassination with total impunity of Dr MLK, and Malcolm X at that time 50 years ago. The first thing we did Sunday, and the first march that led to the big march was the Backward March led by Pastor Glasgow of The Peoples Ordinary Society (TOPS…www.theordinarypeoplesociety.org). It was to symbolize the need to go back to our people power, to go back to being a WHOLE community of people. To re-member the body broken by state violence and by mass incarceration. To mark the invisibility of the ex incarcerated, according to Pastor Glasgow, “We have to go back in order to move forward together”. 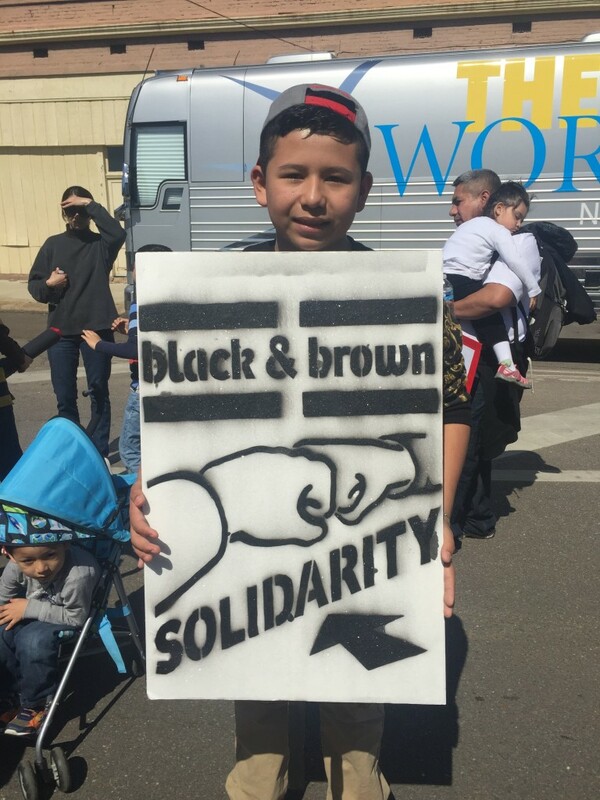 The SMA group led by Stephanie G, and Emery W, co directors of Project South, marched with 75,000 people creating new knowledge and shared knowledge as we marched and occupied the bridge. The bridge experience created new knowledge of where the civil rights movement is today and where the struggle for liberation continues. Ferguson and the many Fergusons, where police have killed innocent and unarmed people with total impunity we consider racial hate crime…the people on the Selma bridge. A new sense of justice was created on the Selma bridge. One where Zimmerman would be behind bars, and where Marissa Alexander would be free. Selma is the CALL-TO-ACTION for the new Southern Freedom Movement of the 21st century, and one to address the new situation and political moment in the US global South, for Black National question of Liberation and a call to action to confront, dismantle racism and the structures of oppression and militarized state violence. The war against Blacks. The war on Browns. Enough is Enough! Unite to Fight. We all Count!!! We must build our movements, our southern peoples power and make change by dismantling the old and building the new society. 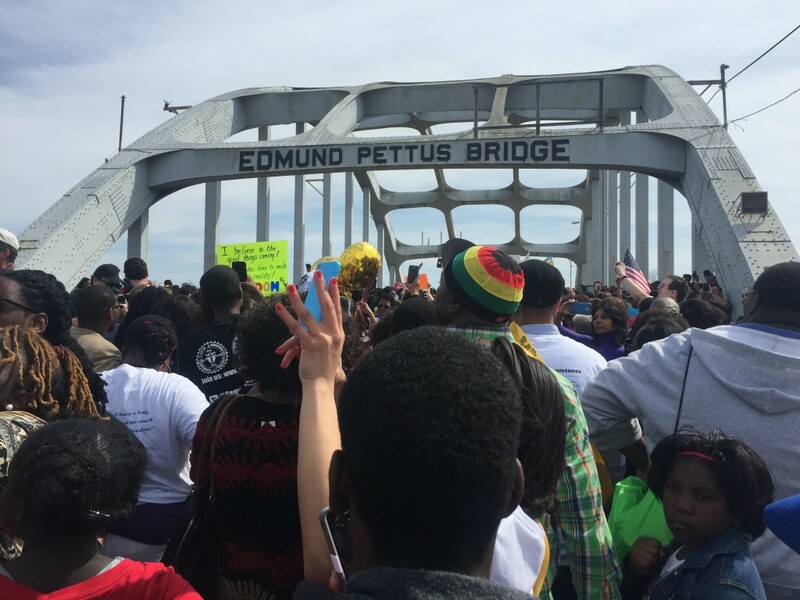 The first steps have been taken on the Selma Bridge on March 7, 2015. Fifty years from now we will look back and say, it all started that day when the people took over the leadership of the old civil rights movement made it a human rights movement and southern peoples governance.